The Echinoblog: Is it Love? Mutualism in Leather Stars (Dermasterias) and Scale Worms (Arctonoe)!! Is it Love? Mutualism in Leather Stars (Dermasterias) and Scale Worms (Arctonoe)!! 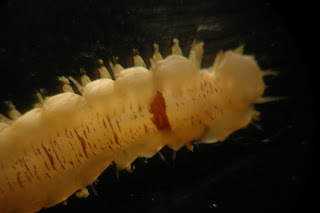 So, with all this talk of Invertebrate Blog War, I thought I would veer away from all of that and instead talk about the more positive relationships that are observed between two different phyla of invertebrates. This is based on a paper by Wagner et al. 1979 that details the relationship between two species that are found all along the west (Pacific) Coast of North America. 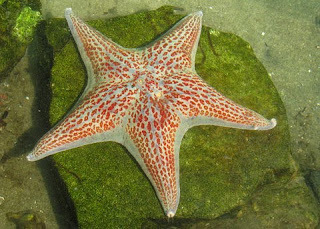 One of them is this species, a sea star, Dermasterias imbricata, aka the Leather Star or the Garlic Star. AND along with it is a worm. A member of the Polynoidae called Arctonoe, species- A. vittata. 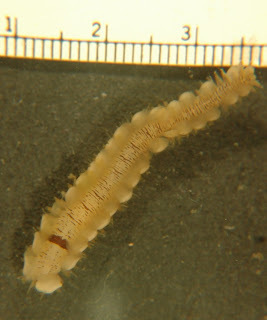 This worm lives in the tube foot grooves of Dermasterias. 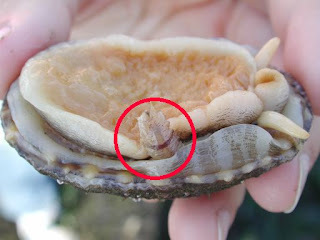 They basically take residence in the spaces between the tube feet and make themselves at home in all of the open space. This relationship was observed by many of the early Pacific coast naturalists and was labelled commensalism, that is two species that lived together but neither species had either loss or gain. Kind of a "roommates that pass in the night" kind of arrangement. Here's a cool video that shows the worm ON the underside of the leather star and in/around the animal's tube foot groove. These worms have apparently been shown to be chemically attracted to their hosts. This doesn't really come as a surprise. If they live in the "house" that one of these species provides, then they should know how to find it. But how far gone is the relationship between this worm and its host??? Wagner et al. 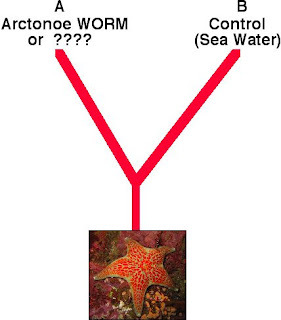 wanted to know the extent to which Dermasterias (the starfish) were attracted to the worms in a "Y-shaped" aquatic maze. It was basically given a choice of the worm in one arm (A) versus control (B).. Which arm of the maze would Dermasterias choose? The worms have been shown to move toward their sea star host, but in the total number of trials... Amazingly in 16/20 trials, the sea stars also moved towards the WORM! They also changed variables. 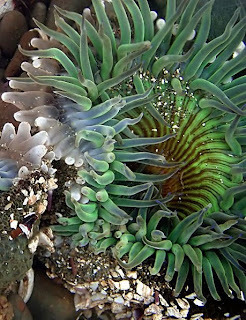 They switched out the commensal worm with a free-living worm, other food items, the sea anemone Anthopleura. And even more amazing?? 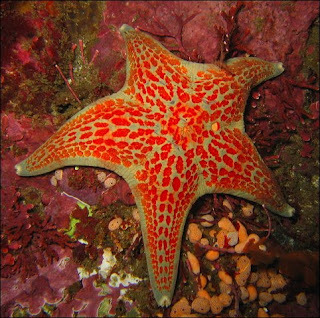 The sea stars PREFER the commensal OVER its favorite food item! Another curious dynamic?? The stars will take the worms REGARDLESS of which host it lived in! They removed one from a limpet, placed it into the maze, and voila! The sea star STILL likes the worm ! So, its not so much a commensal relationship but a MUTUAL one!! Both of them get something out of it! So...Why? What makes the starfish WANT a worm living in its tube foot groove and in/among its parts? Wagner et al. speculate that this is tied to the worm feeding on either mucus, detritus or other prey. 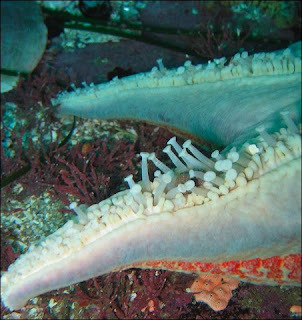 Curiously, they notice that the worms might be hanging out on starfish that LACK pedicellariae, which are pincers or clamp-like stuctures that starfish use to remove surface detritus/defence etc. As an end note, they caution that the experimental results aren't necessarily an indication of what is "real" in the wild. So, one hopes that someday, someone will pick up this study and follow up on these curious relationships, not to mention the other species that harbor these worms! Mystery of the Mud Star: Ctenodiscus REVEALED! !